First of all, I cannot begin to express the benefits that have been mine over the past several years as I have read through God’s Word annually. Private time with our Lord and His Word are of the utmost importance for every child of God. Oftentimes, we have a tendency to only study small portions of Scripture or certain doctrines. That can sometimes skew our overall “viewpoint” and understanding of the Bible as a whole. Having read through the Bible each year for several years now, I have come to see that there are several important keys to finishing this project. This short article will outline the principles that will guide you through this enriching journey. First of all, you must commit to this. I have witnessed numerous people…good solid Christian people…that have begun reading through the Bible and didn’t make it a month. It takes dedication but it is not as much as one may think. The actual reading takes 15-20 minutes daily. I have a tendency to reread passages and yet I’m always done in less than 30 minutes. 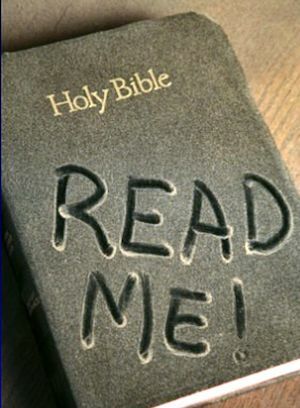 You must realize, nothing in life can benefit you like the reading of God’s Word. For less than the time of one sitcom daily, you can read through God’s Word this year. Can you not sacrifice this small amount of time daily for the One Who gave all for you? Secondly, do not be random. Read in the same place and at the same time every day. This is critical to making sure it is done. Reading God’s Word must be part of your daily routine. I have friends that do this at night just before going to bed and it works great for them. Personally, I read every morning with a cup of coffee. If something ever happens (and certainly it does), I make a point to read as soon as possible so I’m not off track. This reading is part of my daily routine just like brushing my teeth. Thirdly, decide now what method you plan to use. There are a number of ways to read through God’s Word. I have used the One Year Bible twice and it’s a great daily Bible. It divides the Scripture into 365 readings. In 2014, they have even released a Chronological version which I plan to use this year. With these, if one starts on January 1 and reads daily through December 31, he will have read through the Bible. There are several websites that will actually email you daily portions of Scripture that will work you through the Bible in a year. There are a number of charts that you can use as a checklist to read daily. There certainly is a way that suits you. You just need to figure out which one is best. If possible, make this journey with other people – preferably other church members. This will give you something to talk about with one another. You can also hold one another accountable. There’s strength in numbers. Having a friend (or friends) to commit to this with will help you stick with it. Lastly, you are going to have some days that things happen and you just don’t read. Never…under any circumstances…get more than 2 days behind. There’s a point mentally when you will give up if you get too far behind. Do not let this happen. Try your best to stay caught up. But, let 2 days be your maximum amount behind. When you hit this point, read 1 ½ days worth of reading until you are caught back up. You can do this. And, you will wonder why you didn’t start it years ago once you finish. Lord willing, I’ll do this for the rest of my life. It has been a great benefit to me and the church here. I hope these few tips can help you feel the same way in years to come. Watering the Tulips is brought to you by Sovereign Grace Baptist Church in Northport, AL. For more information, please visit www.sovereigngrace.net. “Your App to the Gospel” is available at iTunes, Google Play, the Windows Phone Marketplace and now available on Windows 8/8.1 tablets and PCs in the Microsoft Store. Please download it today! !